Some garden seeds are very hard to sow because they are so tiny. Once in the soil, the rain often washes them away. To solve this, try making homemade seed tapes to be sure the seeds grow right where you want them. 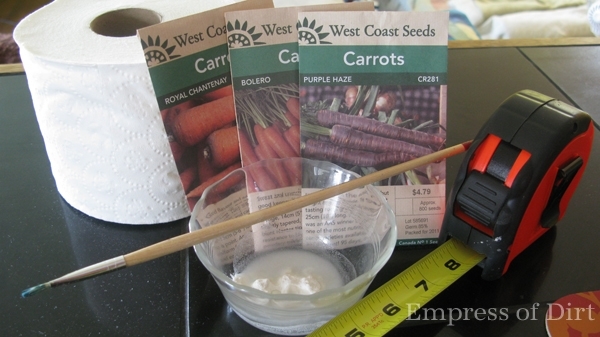 For more, I have listed more tips and tricks for handling tiny seeds here. Wait! Where Did My Seeds Go? Some seeds are just so tiny that when you try to plant them, the wind blows them away. This tutorial shows you a really simple way to make seed tapes. It’s really just a way to temporarily attach little seeds (like carrot seeds) to a surface that holds them in place while you plant them. Because they’re on a tape (or length of toilet paper, really), you can also control how far apart they are planted. The entire thing is placed in the garden. The toilet paper will disintegrate and the seeds will sprout right where you planted them. There are more seed starting tips here. When seeds are tiny and hard to manage and you don’t want to plant a lot just to thin a bunch out, I say Glue ’em down! It just takes a tiny dab. I first tried making carrot seed tapes last year and my germination rates were excellent. I grew several different varieties and I didn’t have to do any seedling thinning. I’m a thinning klutz so I prefer to sow my seeds carefully instead. This method will work with any fine seeds. 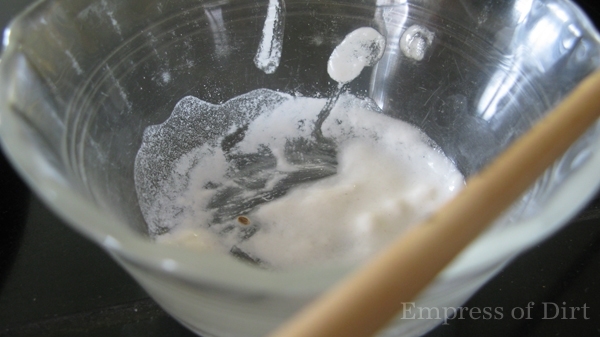 The flour and water glue should be thick enough to sit on the end of your brush or pencil without dripping. You need only about a teaspoon of flour to glue several tapes. My raised beds are 4×8′ so I make my seed tapes in 2′ lengths. This way I can plant them side by side or in a row the whole width of the bed. Tear off the length of toilet paper you want and write the name of the seed type on it. Decide how close together you want to place the seeds. I place about 50 carrot seeds on a 5″ x 4′ length. 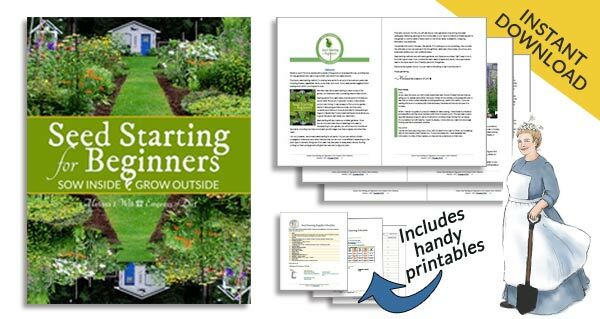 If you are unsure, follow the advice on your seed packet. Pour the number of seeds you’ll be using on a clean plate and spread them apart so they’re easy to pick up one at a time. 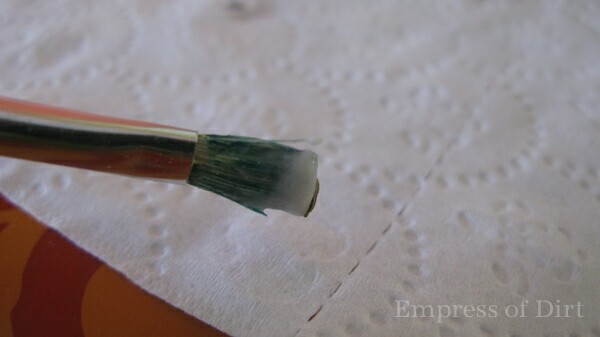 Dab the brush in the glue and then pick up a seed with it. Dab the seed onto the toilet paper and let the glue settle around it. Use your finger to help if you need to. When you’re done, leave the whole thing to dry. Even when the glue is dry, the seeds stay stuck to the paper quite well. If you have leftover seeds that you want to use up, you can make a few T.P. seed bombs. 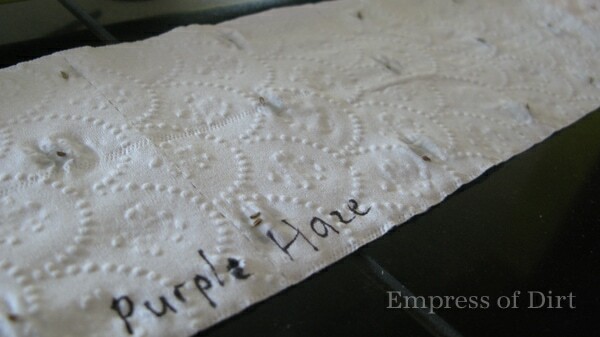 Take smaller sections of toilet paper, write the name of the seeds on them, and glue on more seeds. I use the mini seed tapes to add patches of veggies to gaps in my flower beds. To plant the tape, prepare your growing area as usual and lay the tape down. Cover it with the appropriate depth of soil and water as usual. The toilet paper gradually dissolves and the seeds take root. I got a stellar crop this way last year. I also have extremely sandy soil which pleases carrots immensely. As mentioned, this works well with other seeds too, not just carrots. 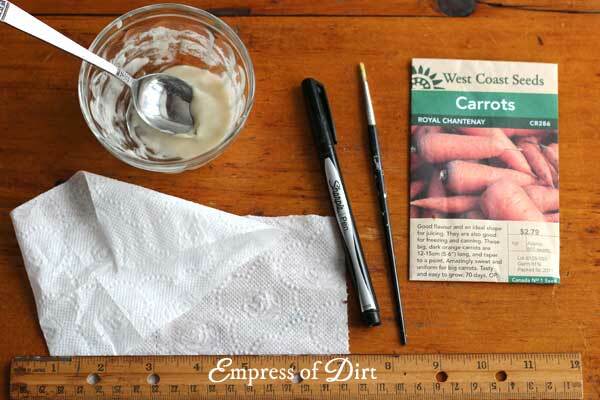 TIP: The optimum soil temperature for sowing carrots seeds is 80F (26C). You can check with a kitchen meat thermometer like this one. 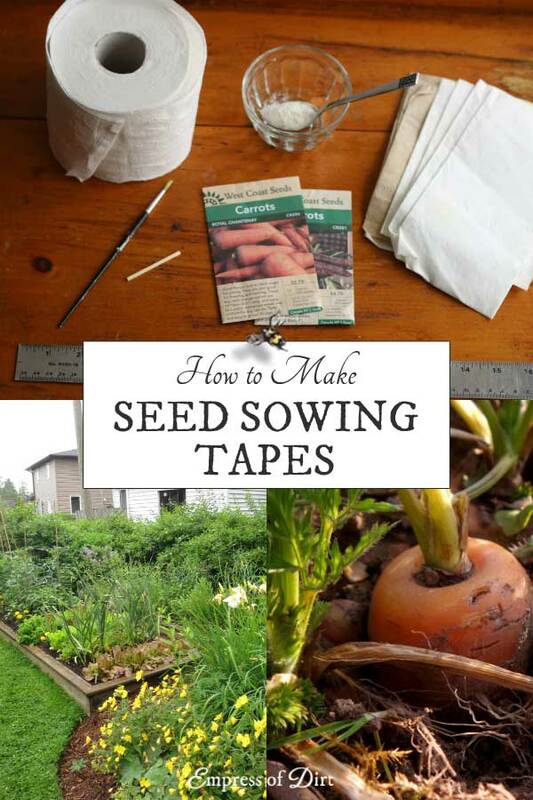 If you’re not ready to plant them yet, just leave the seed tapes flat, stacking one on top of the next. As long as they don’t get wet or shaken, they should be fine until you’re ready to use them. Seeds do best in cool, dry storage, just above freezing. You can read more tips here. Many of us cannot provide optimum conditions but do the best we can. 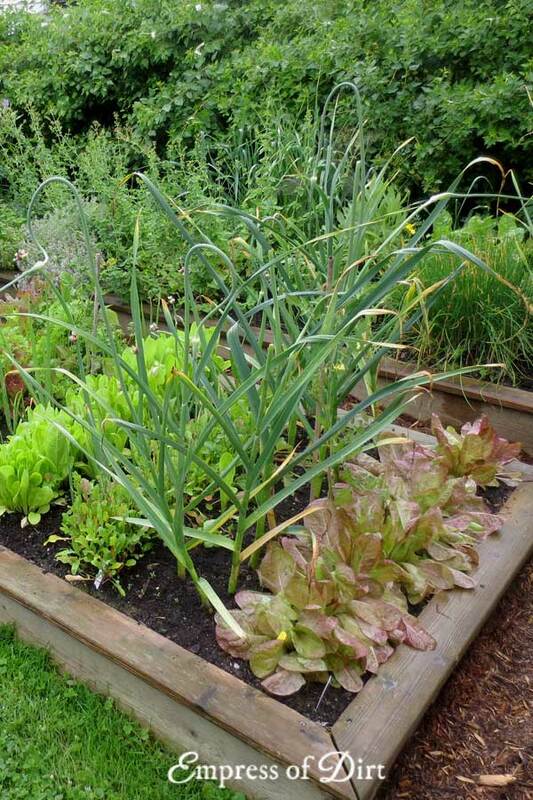 Use just the number of seeds you want to plant, without having to thin them out. 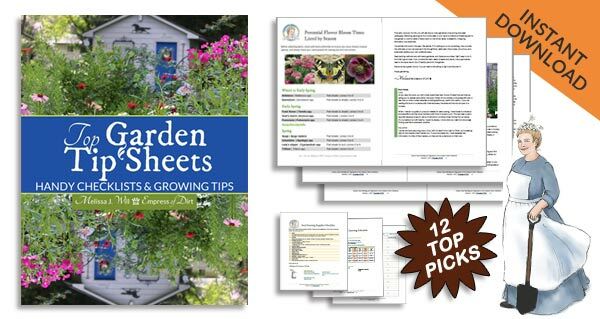 Save on the cost of seeds. 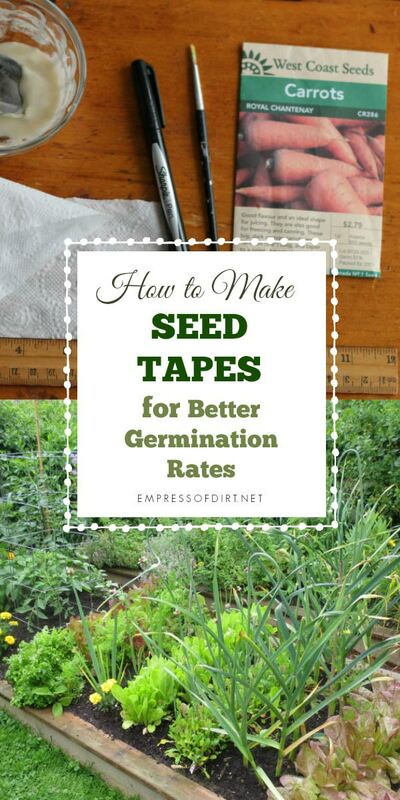 If you’re like me and like to try a wide variety of seeds but don’t have a garden buddy nearby to share shipping costs and packets with, exact planting with seed tapes is a frugal alternative. Making seed tapes is a bit slow but surprisingly relaxing. Go figure. 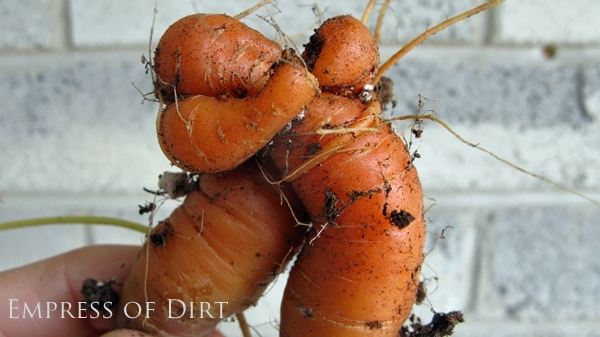 Now that I’ve picked the carrots, it was time for them to say their goodbyes. PS: There are other good tips for sowing tiny seeds here. I know this is quite old, but the “contact authorities” bit made me laugh so hard. Great tutorial! I usually just use Elmer’s Glue. I also stick a straight pin through a pencil eraser and dip the head of the pin in the glue to pick up the seeds. I’ve hestiated to use commercial glue because I’m not sure exactly what is in it. That’s quite a fine skill with the straight pin! Oh I’m so excited to try out all of your ideas. Thank you so much for sharing! going to definitely try this this year…..and hope I don’t need to contact the authorities! Thanks for the tip. Going to give it a try. Could use something relaxing to try too! Making seed tapes is definitely low key entertainment! Seed tapes are costly here too. These tapes take time to make but work very nicely. I got some seeds to trial and the regular orange carrots were on a tape and I found didn’t do so well, but were nicely spaced. I really like the heirloom carrots in different colors so will make tapes for them next year. thanks for the tutorial on that. 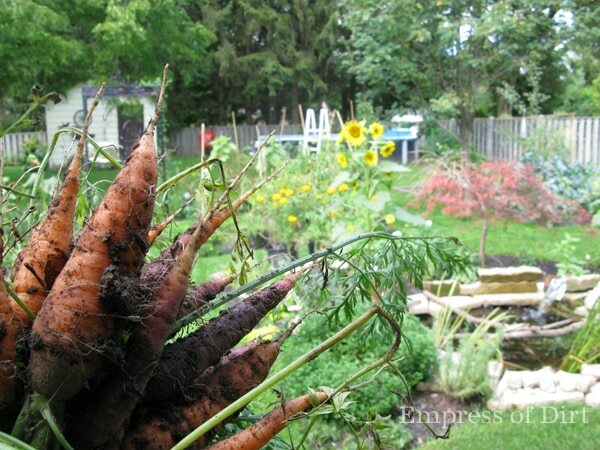 Carrot seeds can be fickle!